This help note and video will walk you through the steps to move your Calxa data online. The three steps you'll take: 1. Import your database to an online workspace; 2. Reconnect to your accounting file; and 3. Invite users and set their permissions. Calxa's workspace transfer function makes it easy for you to move online. The workspace transfer will migrate a complete local or network database to online. The transfer will copy all of the current data and established settings including report bundles and custom KPIs. At this stage, you may choose to access your online workspace via the desktop software until we've added all existing desktop features to the online app. It's worth moving to an online workspace now to take advantage of new features like automated organisation updates and automated report bundles with email delivery. Note all future improvements to Calxa functionality will happen in the online app. We encourage you to start using the online app along with the desktop software. Any changes you make in the desktop app will be reflected in the online app, and vice versa, since you are working with the same data. Instructions for using the app can be found in the Help Centre. NOTE 1: Online workspaces support online accounting systems only. MYOB AccountRight (My Library and Network Libraries files) and MYOB Classic (MYOB AccountRight Premier v19 & earlier) files cannot be used with an online workspace. NOTE 2: Only a subscription owner or co-owner can perform the steps outlined below. Begin by opening up your existing Calxa desktop software. Ensure you have the latest Calxa software installed - Open up your Calxa desktop software version 4.5.0. If you receive a prompt when opening Calxa saying there are updates to install it means you aren't using version 4.5.0. If you aren't running version 4.5.0 you will need to install updates first before importing your workspace, either via the update prompt in the pop-up box as Calxa launches or by clicking the Check for Updates button on the General toolbar. If you aren't able to use the automatic update methods try manually installing the update. Note some users may not have permission to install software on their machines. If that's your situation please contact your IT support provider or system administrator to install the update for you. Next check where your database is saved. If you don't know whether you use a local or network database have a look at the bottom left side of your Calxa screen. A local database will show the data source as a file path, most commonly on the C: drive. A network database will start with SqlServer. If you see Data Source: with a name of some kind with no file path or SqlServer noted, you already have an online workspace so don't need to proceed any further. The database example shown below is a local database. Write down the details about your database or take a screen snipping, you will need them shortly. You will sign in to Calxa Online via the Authentication screen. 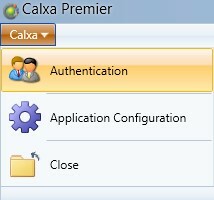 Click Calxa in the upper left corner and select Authentication from the drop down menu. Under Workspaces on the left panel click Online. If you already have an online workspace(s) you might instead see a list of workspaces - if that's the case skip to step 3. below (you are at step 2.3 now). Enter your email address and password and click Sign In. Note: To reset your password click the Forgot your password link. You will be sent an email with a link to reset it. New online users will see a screen like the one below, but there won't be any workspaces listed. Click on the Import Workspace button. Note the workspace transfer copies your local/network database to the online workspace. Your original database is retained in this process, no data is deleted, therefore if you choose to revert to your local/network files later they will still be available (provided you don't delete the .CalxaDB local database file or SQL database yourself at some later point). The Select Workspace Transfer Source box will pop up. Click on Local on the left side, then click on the Open button next to File name. *Network database users - please continue from step 2. in the Import Workspace - Network database to Online section below. Navigate to where your local database is saved in the File Explorer box that pops up. Select it and click Open. The Calxa Authentication default setting is a user name of Administrator with a blank password. If you aren't sure of your credentials try the default. If you have set a password or another user name on the Calxa database please enter that here instead. Click Sign In. The Import workspace properties box will open. The default name assigned to your workspace will be displayed at the top. You can update this name to something more descriptive if you like, then click OK when finished. A Workspace Transfer status box will pop up showing each step of the workspace transfer as it is completed. When the import is finished you will see the workspace name in your list of workspaces. Select the workspace on the left and click Log In to open it. When you open the Organisation Management screen you will see your organisation(s) have been transferred to your online workspace, and the workspace name is at the bottom. All of the Calxa screens in the desktop will be identical to those you used previously (other than Automation). You can verify you are in your online workspace any time by looking at the bottom left of the screen of the desktop app. An online workspace will show the data source as a workspace name, whereas a local database will show a file path. A network database source will start with SqlServer. The workspace shown below is the online workspace created in the previous steps. Online subscription organisation capacity: Please note that the number of organisations included in the subscription price is lower in online than in desktop (due to online storage costs). A Calxa Premier online subscription includes 5 organisations. Express includes 1 organisation. Note you will still also have access to the desktop licence organisation capacity after moving online. You will be allowed to transfer your entire workspace to online if you have more organisations than your subscription includes, however once the transfer completes you will get a message saying that your workspace is in read-only status. To continue working with all the organisations you transferred you can purchase additional organisations for AUD $10 per organisation per month. The Upgrade / Downgrade Subscription help note provides instructions on how to do this. If you don’t need to keep all the organisations you transferred you can delete some via the Organisations screen in the online app or the Organisation Management screen in the desktop app. You can use a combination of an online and a local/network workspace if preferred (i.e. you may keep 5 of your organisations online and the rest on local/network). Moving your database online will require you to reconnect to your online accounting file, as the long-term access token set up in the local/network database won't be available in your new online workspace. You will only need to do this once after moving online. You'll go to the Organisations screen in the online app to reconnect to your accounting system. You will see a list of all your organisations (across all workspaces) with options to reconnect to the accounting system, sync, rename and delete all in the one screen. NOTE: Online workspaces support online accounting systems only. MYOB AccountRight (My Library and Network Libraries files) and MYOB Classic (MYOB AccountRight Premier v19 & earlier) files cannot be used with an online workspace. Navigate there via the ellipsis at the top right -> Admin -> Organisations. Next click on the ellipsis to the right of the organisation you want to reconnect and select Reconnect from the drop-down. In the desktop app there is a slightly different method to reconnect for each accounting system. You will reset each of them from the Organisation Management screen. Please see instructions in the Reconnect to your MYOB AccountRight Organisation section of the Connecting and Updating: MYOB AccountRight help note. Refer to the Reconnect to your Xero Organisation section of the Connecting and Updating: Xero help note. 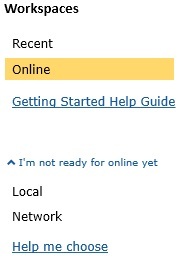 See the Reconnect to your QuickBooks Online Organisation section of the Connecting and Updating: QuickBooks help note. See the Reconnect to your MYOB Essentials Organisation section of the Connecting and Updating: MYOB Essentials help note. Having moved to an online workspace, you will now need to re-invite users to your new workspace using their email addresses, then set the permissions you want them to have. See the online app Invite a User and Set User Permissions help notes for full instructions. To invite users via the desktop app please refer to Configure Calxa Users and Permissions. You have now completed your move to an online workspace. We hope you enjoy the Calxa online app experience! Please refer to steps 1.-4. above under Import Workspace - Local Database to Online Workspace, then return to step 2. below. The Select Workspace Transfer Source box will pop up. Click on Network on the left side. Your server name, database and server authentication should be automatically populated for you, but if they aren't you can browse for them via the drop-down next to each. The Calxa Authentication default setting is a user name of Administrator with a blank password. If you aren't sure of your credentials try the default. If you have a different user name and password on the Calxa database please enter that here instead. Click Sign In. Please continue from steps 7.-12. above in the Import Workspace - Local Database to Online Workspace section.